Well, not the identity of my Secret Santa - that is still very much a secret and I have to thank his alter-ego, Sven, for his playful taunts. However, Christmas day has now come and gone and I eagerly tore open the wrapping paper of my three parcels to reveal the following great choices of game. Thanks ever so much, Secret Santa. I shall really enjoy playing these in the near future. 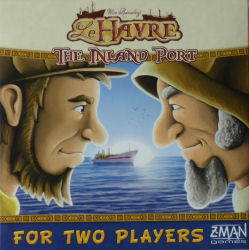 Chris and I tried Uwe Rosenberg's new two-player Le Havre game. The Inland Port combines the purchasing and activating buildings elements of Le Havre with the timing wheel of Ora & Labora and it works very well. It's a very thinky and dryÂ game and I reckon Guy would enjoy it very much. Our game took us just over an hour and I would expect the time to come downÂ with familiarity but I'm not sure we'd ever get it down to the claimed thirty minutes. 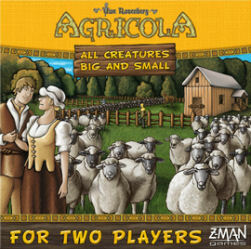 Certainly a lot more time to play than Agricola: All Creatures Big & Small. A very good game that has just edged out Equilibrion on my Six Picks for Solo / Two-player games of 2012. We had a do at our house yesterday with Jan's sister and family and party games were requested and dutifully delivered by yours truly. We managed to fit in Telestrations, Timeline: Inventions, Pluckin' Pairs, Say Anything, Tumblin' Dice, Cash 'n' Guns and Riff Raff. It was the first time I'd tried Pluckin' Pairs and it worked pretty well. Eleven picture cards are laid out and then everyone has 90 seconds to write down five pairsÂ with one pictureÂ left over. You then compare answers and you score a point for every player who gave the same pair as you unless everyone chose that same pair. Very simple with some interesting conversations about why people had chosen the pairs they had. It's getting towards the end of the year and my thoughts are turning to my annual six picks for the best games of 2012. It will be interesting to see how this year's choices compare with previous years as I sense my most enjoyable games have been even more at the lighter end of the scale than usual (accepting that I have always had a preference for tight rules and elegant mechanisms). However, there are one or two more substantial games that have impressed me - can you work out what they are? Hopefully, some of the Shrewsbury Boardgames Club will also give me their six picks for 2012 so we should get an interesting comparison going: Mark G's choices of anything involving conflict; Nige's selections of anything that's "not fun"; Guy's quickest games of the year andÂ Andrew's picks of games in which he manages not to throw away an insurmountable lead,Â to name just a few. Any of our players who wants to give me their picks can do so either by email or handing me a scrappy bit of paper next Friday (21st). If you want to give me some narrative backing up your choices, all the better - otherwise I might just pour scorn on your inappropriate choices. I'll then publish any submissions I get over the festive period. In November, I only managed 12 plays of 9 different titles, six of which were new to me. 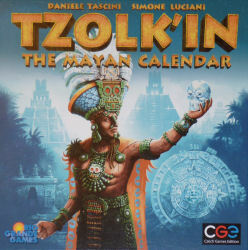 The new titles were Tzolk'in, Get Bit, Gauntlet of Fools, Merchant of Venus (2nd Edition), Timeline: Inventions and Morels. I only added two games to the collection, both brought back during my trip to Toronto, and my unplayed games list is only down to 26. There was no outstanding game I played this month but the one that gets my vote for Game of the Month for November is Morels, a two-player set-collection card game which I can see playing several times as it's in the same mould as Jaipur. 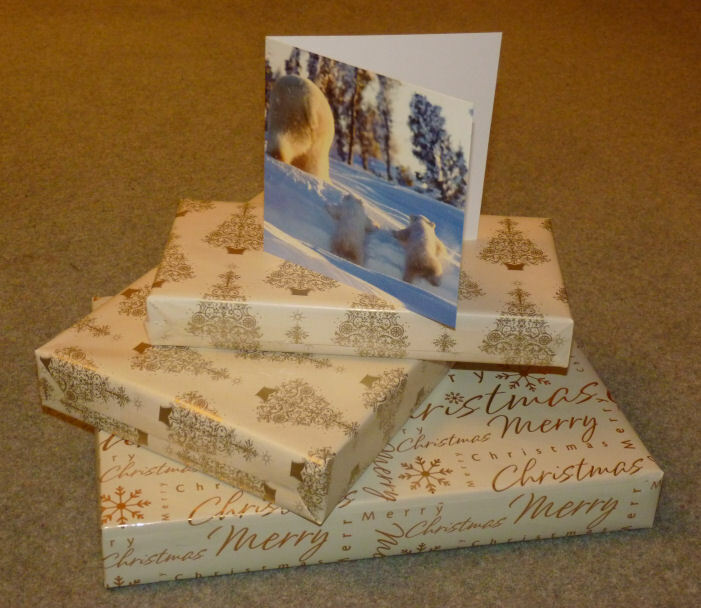 The message on the card simply read "From your USA Secret Santa". Well, whoever you are, thank you so much for your generosity. I will be really excited when I break open the wrapping paper on 25th December. I've been in Toronto the last couple of days and my hotel is fifty yards away from the two best game shops in the city. I wasn't planning on buying anything but the new Merchants of Venus was only $56 so I gave in to temptation. And just so it wasn't lonely on my trip back, I also picked up Timelines: Inventions for Christmas trivia gaming. This month I managed 23 plays of 17 titles, 14 of which were new to me. The new games were Libertalia, Escape: Curse of the Temple, Rune Age, Doctor Who: The Card Game, Smash Up, Lady Alice, Love Letter, AttrAction, Drecksau, Rondo, Spellbound, Suburbia, Hanabi and Hooyah: Navy Seals Card Game. As it was Essen month, I added 33 new games to the collection and my unplayed list has rocketed up to 30. 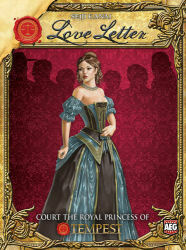 As for game of the month, I'm going for the smallest game of all, Love Letter, which is just made up of 16 cards. That's it. However, the game play is really smooth and it is a great game to play with Jan (not only for the reason that she keeps beating me). Just the thing when you've got just 15-20 minutes to spare and limited space. Easily playable on a train or aeroplane table. This weekend on the 3rd and 4th November 2012, there will be an Autumn Beer & Pretzels convention at the Town Hall, Burton on Trent. It runs from 10am to 8pm on the Saturday and 10am to 7pm on the Sunday. Entry is Â£5 per day or Â£9 for both. Further details can be found on the Spirit Games website. 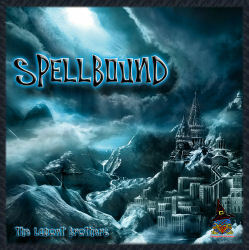 I tried a solo run-through of Spellbound this evening. I didn't get very far - the solo game seems really hard. You are really punished during the end-of-deck phase with only one mage covering cities/wilderness. My lazy city watchman turned up too late to help so I lost one spell book during that phase and once the witch encounter was completed, I drew the one witch card I didn't want to, andÂ lost my second spell book. Phooey! Overall, I found the game quite interesting and reminiscent of Friedemann Friese'sÂ Friday, although my initial impression is that this is more of a deck-thickening game rather than deck-thinning (to lengthen the time between witch encounters). It will be interesting to see how it plays multi-player. Received an email today from Josh Edwards inviting me to link to his game review blog. I'm happy to oblige as he covers the same sorts of games as we play and his review style is pretty good with good justification for why he does or doesn't like a game. The link is in the Other Game Blogs section to the right or you can simply click here. 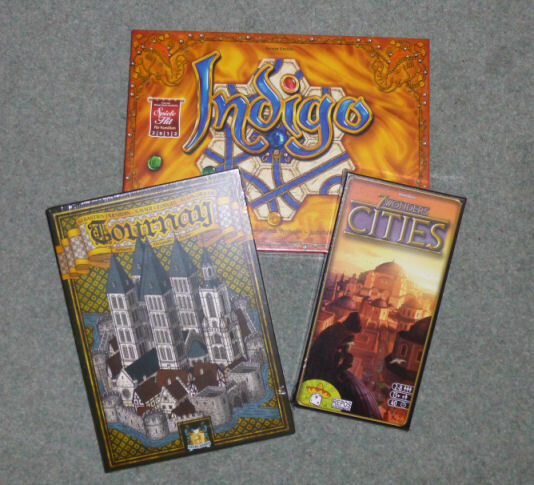 Four more additions to my stack of games from Essen. 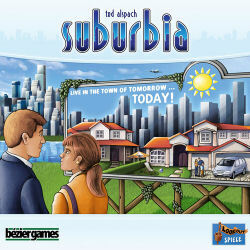 This evening, I dropped in at Gameslore and picked up Suburbia (which to my horror was sold out by 10.30am on the Friday at Essen), Tzolk'in and Goblins Inc. (both of which were cheaper from Gameslore than at the fair) and Amber, as I recall someone giving it a recommendation late on the Friday, just before I left. Well I'm back from another two days at the Spiel game fair in Essen, Germany and had a good time as usual. I'll post more information about the trip later but, for now, here is the traditional photo of the 27 games I brought back with me. 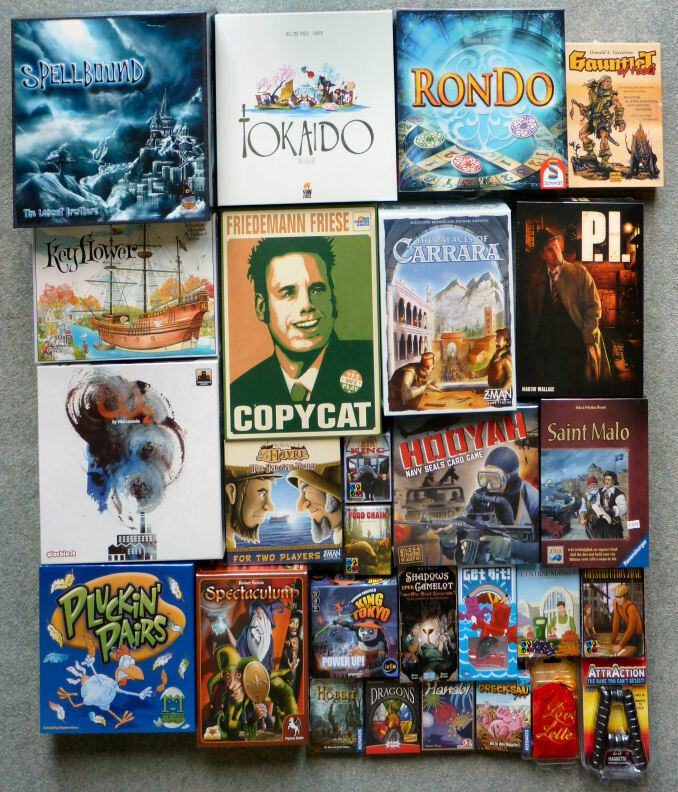 The games are Spellbound, Tokaido, Rondo, Gauntlet of Fools, Keyflower, Copycat, The Palaces of Carrara, P.I., CO2, Le Havre: The Inland Port, Air King, Food Chain, Hooyah, Saint Malo, Pluckin' Pairs, Spectaculum, King of Tokyo: Power Up, Shadows Over Camelot: The Card Game, Get Bit, Central Market, Construction Zone, The Hobbit: The Card Game, Dragons, Hanabi, Drecksau, Love Letter and AttrAction. 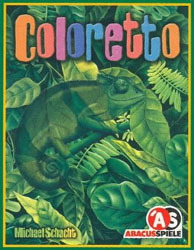 Heimlich & Co (Amigo) - Fabulous game that's being re-released and I've never owned a copy. Maybe that will change. Mutant Meeples (Bezier) - Surely I can't be tempted to buy a version of Ricochet Robots where each robot has super-powers? Nige is sure to love this. Tokaido (FunForge) - Antoine Bauza is a good designer but is a zen race game going to be any good? 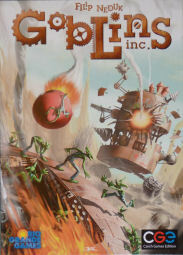 CO2 (Giochix/Stronghold) - By the designer of Vinhos, this has an environmental theme. This might be my heaviest game purchase, although it might be more one for Nige. Gauntlet of Fools (Indie Boards & Cards) - A new Donald X game where everyone dies. It's all about how big a blaze of glory you can go out in. Legend of Andor (Kosmos) - Not sure if there's an English version going to be there. As cards look to be text heavy, I'll wait if not. Home Stretch (R&R) - Horse racing game. Is there anything to make it different enough from Long Shot? 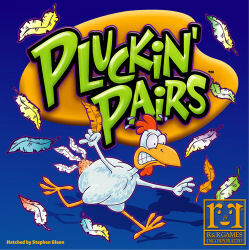 Pluckin' Pairs (R&R) - Stephen Glenn game that is likely to be my party game pick-up of the year. Snowdonia (Surprised Stare) - Tony Boydell's game ofÂ building aÂ railwayÂ up a Welsh mountain. What's not to like? Vampire Empire (White Goblin) -Â A two-player bluffing and deduction game. Is this anything like Kosmos' Dracula game? And... Morels arrived today, taking just a week to whisk its way across the Atlantic. Hoping to play it soon. The winners of this year's International Gamers Awards have just been announced. 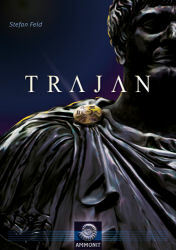 In the multi-player game category, the winner was Trajan designed by Stefan Feld and published by Ammonit-Spiele. (That should please Nige!) In the two-player category, the winner was Agricola: All Creatures Big and Small by Uwe Rosenberg and published by Lookout Games. Both of these are well deserved winners so congratulations to both designers and publishers. 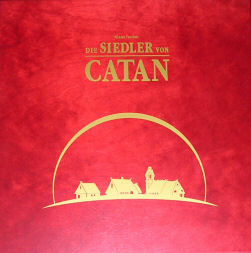 The awards will, I'm assuming, be presented as usual at Essen - less than two weeks to go now. I arrived home yesterday fo find a parcel had arrived for me. Inside was the result of my very first Kickstarter participation. 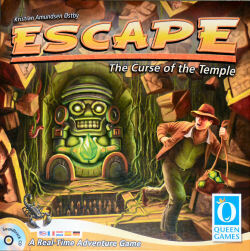 This was backing Queen Games' production of Escape: The Curse of the Temple. For my support level, I received the game itself, the first expansion (Illusions), a new copy of Roma plus assorted goodies. There are still a few bits to come in December but, having gone through the rules today, I am very excited to try this. Well, September must be the month in which I've played fewest games for absolutely ages (March 2010, actually). Only nine games played all month and four of them new to me (although that's a bit of a stretch as I have played a solo version of one of them in August). The four new ones were Blood Bowl: Team Manager, A Fistful of Penguins, Divinare and my choice for game of the month, D-Day Dice. I played this solo last month but it'sÂ really designedÂ as a multi-player co-operative game, so I class this month's play as my first attempt at the proper game. 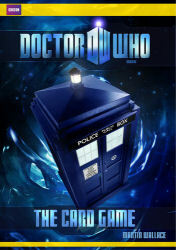 Five purchases this month: Rory's Story Cubes, A Fistful of Penguins, Doctor Who: The Card Game, Divinare and Libertalia. No games sold but I'm going to have another clearout this month before Essen so watch out for news on that. Came home via Gameslore tonight and picked up three new games: Doctor Who - The Card Game looks a nice game for 3-4 players designed by Martin Wallace; Divinare is a game about mediums and their predictions, designed by Brett Gilbert; and Libertalia is a 45 minute pirate game that looks to have some really nice mechanisms and is getting some good reports from people who've played it. I've been keeping an eye on this really attractive looking two player game for a while. 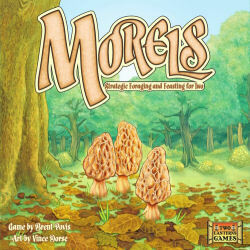 Morels is a game about foraging for mushrooms and is getting a lot of buzz for being a good game to play with a reluctant non-gamer spouse. 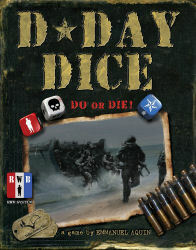 I saw a copy at The Cast Are Dice back in August but it's only available to order by mail from the designer in the U.S. Well, I've finally taken the plunge and ordered a copy. Let's see how long it takes to make its way over here. Is there anything you think I've missed that is a must have (Snowdonia, possibly)? ThisÂ weekend is the next Bolton Games Day.Â It's taking place onÂ Sunday 30th September from about 10.30am to 11pm at St Mary's Church Hall, Horwich, BL6 5QT Just Â£3.50 to get in, and that gets you a plate of something warm around 6pm. And there's a bar open all afternoon. More info can be found here. 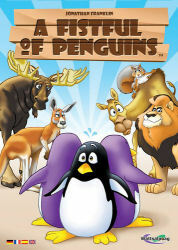 I picked up A Fistful of Penguins at the weekend and got to play it last night with Jan, Bex and Chris. The game is a simple dice game made up of nine dice with different animals on each face of the die. You also get a stack of penguins that allow you to manipulate your turn. On your turn, you roll four,five or six dice (increasing in each of the three rounds) and you either stick with your result or spend penguins either to add dice or re-roll your existing dice. When you stick, you score for the animals you have displayed. Highest score after three rounds of play wins. I'm not sure if there is just one optimum strategy - grab as many penguins as you can in the first two rounds and then use your multiple re-rolls to max out on kangaroos. I suggested this as an option to Chris and he executed it perfectly to run away with the victory (105 points with second place only getting 76). However, it was good fun and only took about twenty minutes to play. For the last few months, I've been posting my game snippets directly onto my trickylight site rather than Spiel.co.uk as it's slightly quicker. However, it doesn't allow for comments which is rarely a problem as I get very few comments on the blog as it is. That said, Nige recently asked where the comment facility had gone as he'd wanted to add something to the post on the IGA nominees. So, I've done some re-jigging and now I'm going to put all my general news, thoughtsÂ and snippets on Spiel and a link through from Trickylight. I still don't expect to get many comments but at least the facility is there. The nominees for the International Gamers Awards have just been announced. In the two-player category these were: Agricola: All Creatures Big and Small, by Uwe Rosenberg; Star Trek: Fleet Captains, by Mike Elliot, Bryan Kinsella and Ethan Pasternack; Summoner Wars: Master Set, by Colby Dauch; and Targi, by Andreas Steiger. The nominees for the International Gamers Awards have just been announced. In the multi-player category these were: Dungeon Petz, by Vlaada Chvátil; Eclipse, by Touko Tahkokallio; Hawaii, by Greg Daigle; Helvetia, by Matthias Cramer; Kingdom Builder, by Donald X. Vaccarino; Last Will, by Vladimir Suchý; Mage Knight: Board Game, by Vlaada Chvátil; Ora et Labora, by Uwe Rosenberg; Prêt-à-Porter, by Ignacy Trzewiczek; Risk Legacy, by Rob Daviau and Chris Dupuis; Trajan, by Stefan Feld; and Village, by Inka and Markus Brand. This month, I managed 30 plays of 21 different titles, 9 of which were new to me. The new games were Tales of the Arabian Nights, Avanti, D-Day Dice, Descent: Journeys in the Dark (2nd Edition), Dungeonquest, Einfach Genial: Das Wurfelspiel, Last Night on Earth, Sky Traders and Game of the Month - Village. My most played games were Equilibrion and Pit which both saw multiple plays on holiday in Croatia. Three purchases this month: D-Day Dice, Tales of the Arabian Nights and Around the World in 80 Days (a second hand copy Pete Darby was flogging at The Cast Are Dice). Just back from a week's holiday in Croatia and managed to get a fair few games played in the evenings. King of Tokyo, Zomdie Dice, Pit, Der Ausreisser, Cafe International Card Game, Dungeon Raiders, King's Breakfast, Vampire and Circus Flohcati all got played. Also played solo Equilibrion four times and finally won the last time. Dominion and Bohnanza Wurfenspiel were taken but not played. Also bought Rory's Story Cubes on the plane home. Well, my trip to Essen is now booked. Having missed last year, I was keen to make the pilgrimage this time. As usual, I fly out on Thursday morning, stay overnight at the Best Western Ypsilon, and fly back on Friday night. 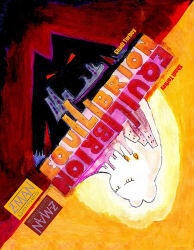 Now the formalities are sorted, I can start looking at the preview information about the show. Also, Mark K has set up a head-to-head league and the code for this league is 40128-124936, but there are only a few spots left as there is a limit of 20 people that can take part. July ended up being a month where I played a number of good games but no great game, so the choice was difficult. I suspect Scripts & Scribes: The Dice Game will be much more engaging with fewer than five players; and Jerusalem played really nicely but was just a bit long in our session. Tier auf Tier (Animal upon Animal) was played three times and is good but not great but I eventually picked Infiltration which we played wrongly first time and second time felt much better - plus the theme is really good and I am in a phase of appreciating theme over twists on previously used mechanics at the moment. Went to the games stall at Shrewsbury market hall today and introduced myself to Chris. For a small stall, they have quite a good selection and they're not all just the standards. 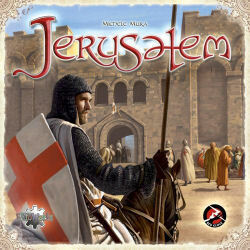 For instance, they had a copy of Jerusalem (which we played last night). Picked up a copy of Zombie Dice and played it this evening. What a daft game but pretty good fun for a 10-15 minute push-your-luck game. Well, the winners have been announced and yet again my predictions were off the mark. 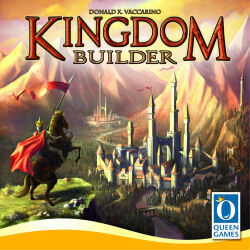 This year's SdJ is Kingdom Builder, designed by Donald X Vaccarino and published by Queen. 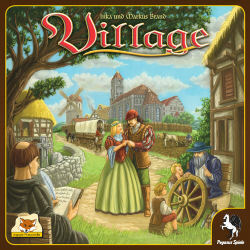 The KedJ is Village, designed by Inka and Marcus Brand and published by eggertspiele. Congratulations to the winners. 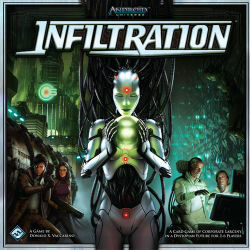 Tried Infiltration again with all the correct rules this time. A three player game with Jan and Chris in which none of us escaped the facility. I was one space short of getting out and would have done had Chris not revealed James Harris, who adds 5 to the proximity dial when he is in play, two turns from the end. I enjoyed it a bit more this time around but Jan didn't really understand the rules and Chris didn't appreciate quite how quickly the game could end. I'm upping my rating to 7 and I'd quite like to see how people who've played it before tackle it a second time around. If you remember the predictions I made about the nominees back in May, you'll know I didn't do a very good job. However, with the announcement of the winner due tomorrow morning and only having three to pick from, surely I can't get this wrong? Well, I haven't played one of the nominees (Eselbrucke); Kingdom Builder is good but I picked it for the Kennerspiel des Jahres; so by default, I'm going for Vegas - which I think does actually fit the SdJ criteria pretty well. As for the Kennerspiel des Jahres, I'm going to go for Targi, which is a nice brain-burning two-player game and it's about time a two-player title got some recognition. I'll let you know tomorrow what actually won. Deeside Defenders have their gauntlet weekend this Saturday, 7th July 2012, running from 10am till 7pm and Sunday 8th July from 10am till 5pm. 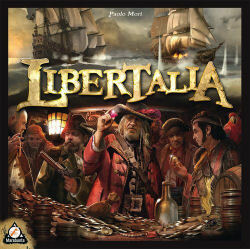 It is mainly wargaming but there will be boardgaming as well. It is at Wings Social Club, Airbus UK, Broughton, Chester, CH4 0DR. Entry is free for both days! Further details and directions can be found on the Deeside Defenders website. 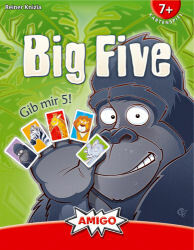 Tried a 3 player game of Reiner Knizia's Big Five this evening. 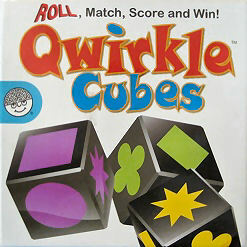 Very reminiscent of Qwirkle but I didn't find it quite as interesting. Trying to build a score in Qwirkle seemed more compelling than racing to get rid of your cards in Big Five. It played well and the others enjoyed it but I was hoping for just a bit more. Ten years ago, an enterprising European decided to register the domain name trickylight.com as their own. Fair enough. My site was registered in 1999 but I had no intention of picking up the dotcom version but I was interested to see what would become of the young upstart. The answer, of course, was nothing and ten years on, having registered it for a ten year period, the enterprising European has let it lapse. Although I knew when it was going to lapse, another enterprising organisation felt the need to bring it to my attention and suggested I contact them so that, together, we could ensure it didn't fall into anyone else's hands. While I didn't believe the interest in trickylight would be strong, the enterprising organisation had other ideas and reminded me on at least half a dozen occasions in the run-up to the lapse date. That said, I resisted and now, a couple of days after trickylight.com was let into the wild, it has now found a new home. Big question is, what should the new owner do with it? After a week's worth of frantic voting (who am I kidding), the winners of this year's awards are Stefan Feld's Castles of Burgundy, Uwe Rosenberg's Ora & Labora and Martin Wallace's A Few Acres of Snow. Congratulations to the winners. I should probably try and get to play O&L and AFAoS sometime. 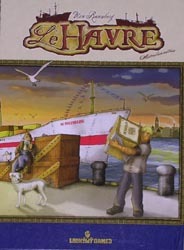 The ipad version of Le Havre has just been released and it looks fantastic, although inevitably a bit cluttered on the 9 inch screen. Only been through the tutorial so far which does a pretty good job if you've previously played the boardgame. Keeping up with the buildings in play and available might take a bit of getting used to. 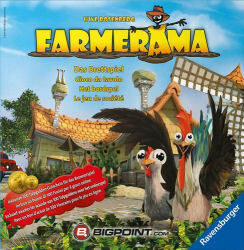 Tried Farmerama yesterday, an Uwe Rosenberg adaptation of an online video game. This solo run-through turned out to be reasonably challenging as you seem to always think you could have been more efficient. I clearly wasn't efficient enough as I scored 142 points whereas the win condition in the solo game is 150. The multi-player game should be quite different (and better) as you need to try and take account of what others might be doing each turn. Solo game is interesting but not really going to hold my interest. The finalists for this year's awards have now been determined. 29 rather than the normal 25, due to ties in the voting. So the choice is between A Few Acres of Snow, Airlines Europe, Belfort, Core Worlds, Discworld: Ankh-Morpork, Dungeon Petz, Eclipse, Eminent Domain, Friday, Hawaii, Helvetia, King of Tokyo, Kingdom Builder, Lancaster, Last Will, Mage Knight, Ora et Labora, Pantheon, Power Grid: The First Sparks, Quarriors!, Risk Legacy, Summoner Wars: Master Set, The Castles of Burgundy, The Lord of the Rings: The Card Game, Ticket to Ride: Team Asia & Legendary Asia, Trajan, Uluru, Vanuatu and Village. Wow! Fourteen of those I haven't played. Anyway, my votes are going for Friday, King of Tokyo and Pantheon but I don't expect any of them to be among the three winners. We'll find out in just under a week's time. 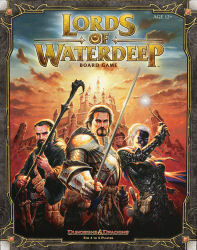 My replacement copy of Lords of Waterdeep arrived today. Bookdepository were very good when they finally got in touch. Apparently, their earlier messages were being blocked but they did manage to telephone me to let me know an undamaged copy was on its way. Plus, they said I didn't need to return the other copy. A new delivery from Amazon.de arrived today. Included in the parcel were Safranito, Uwe Rosenberg's Farmerama, Targi, Step by Step, Big Five, the new version of Sid Sackson's Choice (now called Extra!) 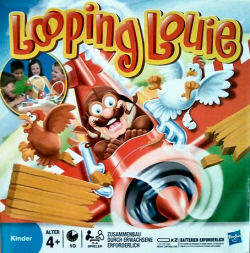 and a new copy of Looping Louie as our existing copy seems to have disappeared into a black hole. It's time again for the Spielfrieks group to vote for the best games from the last 12 months. The first stage is to nominate ten from a list of the 200 most notable titles released in the last year. Not sure my selections are going to be a good reflection of most of the group this year but I opted for Aquileia, Discworld: Ankh Morpork, Elder Sign, Eminent Domain, Friday, King of Tokyo, Kingdom Builder, Pantheon, Santiago de Cuba and Trajan. There's an interesting geeklist on BGG where you browse through the games database page by page and see when you get to a page (each page contains 100 games) where you have not played at least one of the games on that page. I got to page 89 (i.e. I'd got a hit on the first 8,800 games) and the original poster has the record so far at page 92. The last game I got a match on was the Gibsons game, Framed. You can see the geeklist here. 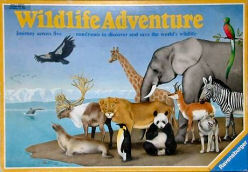 In part, prompted by its appearance in Mark Jackson's current top 100 countdown (#47), I dug out Wolfgang Kramer's Wildlife Adventure and Chris, Jan and I spent a fun hour directing expeditions towards the endangered species we were trying to spot. Even though it's over 25 years old, it's still an excellent game. I'd forgotten the importance of saving enough travel cards for the end of the game once the routes become constricted but it was very close with Jan taking the eventual victory. Great fun - we all rated it an 8. Played Maestro yesterday for the first time in years. 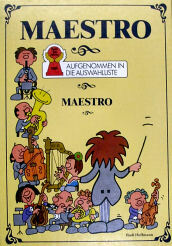 Jan always used to enjoy this, mainly for the theme but it's also a nice set-collecting game with some direct interaction, as your musicians can be stolen by other players to join their orchestras. This turned out to be very tight as the last two maestros didn't turn up until the very end. Hence, Cat got punished for lots of negative points, while Jan got a hard fought win. There's a new 30 minute 2-player version of Agricola out this week, called Agricola: All Creatures Big and Small. Big?... Translation proof-readers - who needs 'em? Anyway, it looks interesting and Steve is bringing me a copy on Friday together with Dobble, a game I got especially for Nige. 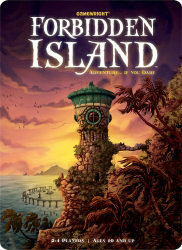 Just played Forbidden Island on the ipad and discovered it is a great implementation. Played solo with two adventurers and managed to escape the island with just four island tiles still above water. The jury of the Spiel des Jahres have decided the shortlist for this year's award should be Kingdom Builder, Vegas and Eselsbrucke. 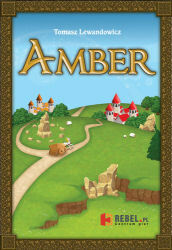 Meanwhile the Kennerspiel des Jahres (gamer's games) nominees are K2, Village and Targi. The list of recommended games is Drecksau, Indigo, Kalimambo,Kulami, Miss Lupin...und das Geheimnis der Zahlen, Pictomania, Rapa Nui, Santa Cruz, Friday, Hawaii and Ora et Labora. 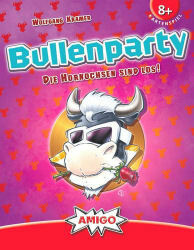 Played Bullenparty this evening. 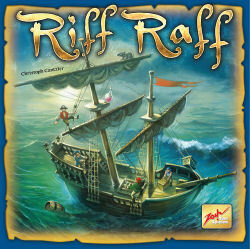 This is the latest from Wolfgang Kramer in the 6 Nimmt card game series. This is perhaps a cross between 6 Nimmt and Coloretto. Tricky decisions about when to take a row and what to put in your scoring piles. And you need to think about what cards you are leaving yourself with at the end of the game. Good stuff - initial rating 7 but could well rise. Next weekend is the UK Games Expo at the Clarendon Suites, Birmingham. The main event runs from 9.30am to 5.00pm on Saturday 26th May and from 9.30am to 4.00pm on Sunday. There is also open gaming at the Strathallan Hotel all day Friday and Saturday evening. More info can be found here. Jan, Bex and I tried the newly-arrived Vegas this evening. 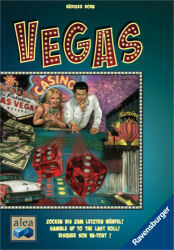 For an Alea game it is very light, although I knew that beforehand. However, it's a nice 30 minute dice game with a little bit of managing your dice, screwing other players, hoping for decent rolls and tearing your hair out when things go against you. A nice start- or end-of-evening game. Jan managed to emerge triumphant on this occasion. 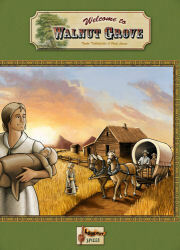 I've just noticed that the Settlers of Catan novel, written by Rebecca Gable, is the Kindle Daily Deal on Amazon. Pick it up before midnight for 99p. Here is the link to the book's Amazon page (if you're reading this after Saturday, the price will have reverted to normal, of course). The latest issue of Spielbox arrived yesterday. The content included reviews of Santa Cruz, Africana, World Without End: The Cardgame, 23, Walnut Grove and Mage Knight among others. 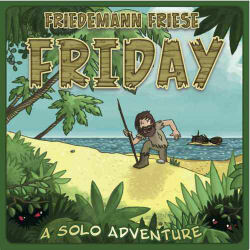 Plus, there is a portrait of Friedemann Friese and a mini-expansion for Hawaii.More details here. It's been a while since I last played Friday and I wasn't sure on which hazards to concentrate. However, I was never really threatened with lack of life points and defeated both pirates with 9 life points left. I played 19 games in April of which 12 were new to me. The new games were Wurfel Bohnanza, Lords of Scotland, City Square Off, Coney Island, Ranking, Crazy Creatures of Doctor Doom, Legend of Drizzt, Little Devils, Africana, Mammut, Dominant Species and Qwirkle Cubes. It was a tough call for game of the month as I really enjoyed the card game, Little Devils, but eventually I went for Michael Schacht’s Africana. Tried this follow-up to the Spiel des Jahres winning Qwirkle as a 2 player game with Jan. A bit more to think about than the original. Our game had the closest finish possible. Thirteen points down with Jan having just one cube left, I needed to roll two diamonds with my last two dice (1 in 36 chance) to win. Not sure who was more surprised when it came up. I had a good day at Telford Mini-Con yesterday although I only got to play 3 games. 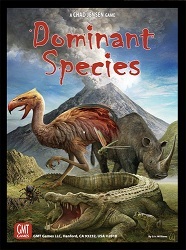 This was mainly due to the length of a six-player session of Dominant Species which took about 4.5 hours. I enjoyed it but felt it would have been better as a four player game. 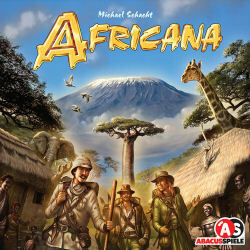 I also got to teach Africana, a new Michael Schacht game that is coming out in May or June, published by Z-Man Games. This was very good with lots to think about and I'm sure it will do well when it is released. The other game played was Mammut which again was a very clever 45 minute game. Thanks to Gameslore for organising the day. 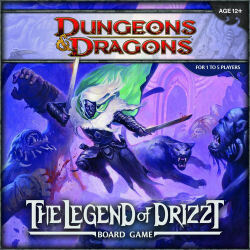 I spotted a copy of Dungeons & Dragons: The Legend of Drizzt for sale on Amazon for Â£32 the other day so decided to snap it up. Hopefully, it'll be here by Friday so we might be able to give it a try... provided Nige doesn't complain too much about yet another co-operative game. This one takes up to 5 players and plays in around an hour. Telford Mini-Con will be held on Saturday 28th April 2012 at Shifnal Village Hall. Start time is 10.00am and will run until 10.00pm. There will be a small library of Board and Card Games which may be borrowed during the event but attendees tend to bring games so there's loads to choose from.. Attending Shifnal Village Hall will accommodate up to 120 people,Â and cost of entryÂ will be Â£5. 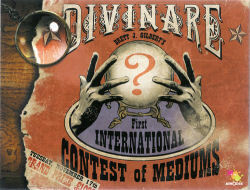 You will get a free ticket for a prize draw. Refreshments There are limited kitchen facilities at the venue, however tea and coffee will be available. There won't be food on the premises, but there is plenty of choice within 200 yards of the venue. (Restaurants, Cafe's, Pub's, Take-aways and Shops) There will be a bar at the event, so you will only need the local pubs for the pub grub. 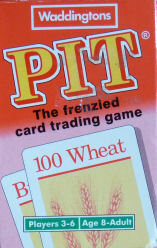 Traders Games Lore Ltd will run a small stall with a limited selection of games at the event. If you want a particular game then it will be safer to letÂ them know in advance. Either contact Gameslore by email telfordminicon@gameslore.com or phoneÂ on 0800 970 2731. Location Shifnal Village Hall, Aston Street, Shifnal, Telford, Shropshire TF11 8DW. 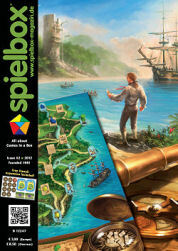 The latest issue of Spielbox arrived yesterday. Within its 56 pages were reviews of Rapa Nui, Coney Island, Ora et Labora and Villlage among others. There was also a recap of what was on show at Nurnberg and a look back at the career of David Parlett with numerous pictures of Hare & Tortoise. This issue also enclosed a mini expansion of six cards for Navegador. I've been in London the last couple of days and popped into Orc's Nest yesterday. To my surprise, they had a shelf of half price games on this visit (never seen a sale before) and one of those games was Jerusalem which has been on my wishlist for a while. At Â£19 I had to grab it, although when I broke open the shrinkwrap tonight, there were no rules in the box. Very odd but the rulesÂ are online and I'm not too unhappy given the nice price I paid. I also picked up Lords of Scotland while I was there. And we're back! If you've tried to get on the site in the last week or so, you haven't been able to as someone forgot to put money in the meter. Basically, I hadn't noticed that the domain name fee hadn't been paid and I didn't get a reminder from the registrar, so Nominet went and suspended it. Thankfully, it's all rectified now. That's all for now. Might be back later testing the capabilities of the new 3rd gen iPad which I'm picking up today (or I might be too busy playing). Karl Bunyan has had the very good idea (although I'm sure many have thought about it before - me included - but he's actually gone and done it) of creating a map of game groups with relevant contact and timing details. I've added our group to the blossoming list. It's interesting: Who ever knew there was a group as far northÂ as York (...or Beyond)? The map is accessed via the Royal Society of Gamers website (Hmm. Haven't publicised that before). Mark Jackson, aka Fluff Daddy or akapastorguy, has started to run through his 2012 version of his top 100 games. The 2005 and 2010 versions of this were really enjoyable as he tends to highlight those lighter (fluffy) games that really stand the test of time. I'm looking forward to seeing which games have catapulted themselves onto the list this time around. And how Tumblin' Dice and Schnappchen Jagd are not in there, I'll never know. There is a geeklist at Boardgamegeek but greater details is on Mark's blog. I've just put in an order for a few games from Allgames4you.de which should turn up next week. Three big box games: Santa Cruz (the new Hans im Gluck release); Helvetia from Glen More designer Matthias Cramer; and Michael Schacht's Africana. On top of that are four little games (just to please Nige): Zooloretto Wurfelspiel; Keltis - Das Wurfelspiel; Wurfel Bohnanza; and Bullenparty. As I ususally do on Superbowl Sunday, I had a go at predicting the result by playing a boardgame version. The last few years I've used Pizza Box Football but this year, 1st & Goal is the new kid on the block so it seemed appropriate to see how this played out. I used the base game so there were no team idiosyncracies to take account of. Bottom line - In a game dominated by the Giants, a couple of key fumbles by the New England offence meant they were playing catch-up in the second half but couldn't break down the New York defence enough to make it close. The Giants win the Superbowl. Q1: The Patriots started the game on their 25 yard line but after one first down had to punt it away. The Giants were initially successful with a 24 yard run play but eventually stalled and had to settle for a field goal. New England's next drive lasted just four plays but they soon got the ball back after intercepting Manning around midfield. Although they again had to punt, the Patriots gathered up a fumble on the return, giving them great field position on the Giants' 23. On the last play of the quarter, a six yard rush brought New England into the endzone for the lead 7-3. Q2: The euphoria of scoring had obviously got to the defence as New England gave up 30 on the kick off return, followed byÂ 45 yard and 32 yard completions to restore New York's lead 7-10. On the second play of the Patriots' next drive, they coughed up the ball giving the Giants great field position just 23 yards from the New England endzone. Two superb run plays took the ball in to give the Giants a 10 point lead but things were about to get worse as the Patriots fumbled the kick off return, leaving the Giants in even better position on their opponents' 21 yard line. The Patriot defence eventually brought themselves back to life to stall the Giant offence but still had to suffer a field goal 7-20. New England had time to get a field goal and prevent their opponents from scoring again to leave the score 10-20 at half time. Q3: The Giants returned to the field feeling pretty happy and were content to keep things tight and wind down the clock. However, the Patriots defence still couldn't stop the mon the key plays and Manning capped an 80 yard drive with a 10 yard touchdown pass midway through the quarter 10-27. New England made some progress on their reply but still were forced to punt as the quarter drew to a close, not helped by giving away a crucial offensive penalty. The Giants ended the quarter on their own 42 yard line. Q4: By this time Manning was mixing up the plays and New England didn't seem to be anywhere near the same wavelength. Another touchdown left the Patriots 24 points adrift with too little time left. At least, Brady started to make some headway but the giants were happy to give away short yardage and eat up the clock. A New England touchdown with a couple of minutes to go brought up the inevitable onside kick but the Giants succeeded in recovering it. 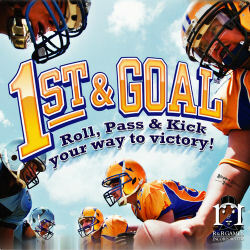 Another first down gave them a further field goal attempt but it fell short leaving the final score 17-34. The New York Giants are Superbowl champions. Jan and I have just returned from a week's holiday in Tenerife where we had brilliant weather, a nice hotel offering plenty of activities - Archery, French Boules and others. Two wins at the French Boules - archery is clearly a game of millimetres and I was millimetres the wrong side of the line every time. Managed to smuggle several games over to the Canaries and back again thankfully, as I got stopped at Customs on the way out as their scanner was showing a large amount of organic matter. Not sure why as I'd only taken LOTR: TCG, Ra: The Dice Game, Cafe International: TCG, Gloria Picktoria, Coloretto, MR: Jack the Ripper, Dominion, Mijnlieff, Archaeology:TCG, Stich Meister, Gold and Keltis: TCG. Got to play five of them including two four-player games of Coloretto with my Dad and Jan's stepdad. Even though it took them a while to grasp the rules, Geoffrey (stepdad-in-law) won the first and Rod (Dad) won the second. The good thing was that, after the first game, they both wanted to have another game straight away. 2011 saw me play 200 games of 156 different titles (interestingly, just one fewer than the 157 different titles played in both 2010 and 2009, although the total plays is down a bit compared with 208 in 2010 and 229 in 2009). My full list of games played is here. 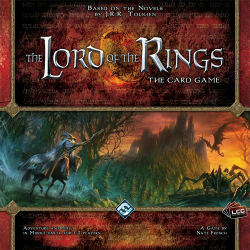 My most played game was Lord of the Rings: The Card Game which sawÂ 8 plays. All bar one of these was in May when the game was first released but I played again just yesterday and I'd like to play some more in 2012. I'm still exploring the mono-sphere decks and haven't yet progressed beyond the first scenario so there's plenty still to try out, even though I will not be buying any of the expansion packs. NoÂ other gameÂ reached 5Â plays and only Nefarious saw four plays.Â Â Of the 156 titles, 125 of them were played just once,Â again due to my focus during the year in getting my unplayed games list down. It started 2011 at 29, droppedÂ all the way to zeroÂ in June and is nowÂ sitting at 16. 2011 seemed to produce several really good games. MyÂ six picks for the yearÂ -which I'll be publishing on my Trickylight site tomorrow- included two meaty gamers' games (Trajan and Vinhos), a couple of middle-weight titles (London and Pantheon) and two excellent but different fillers (Biblios and King of Tokyo). I've also done a six picks of solo and two-player games featuring LOTR: TCG, the surprisingly good Revolver, Famiglia, Gold, Mijnlieff and Zertz (which I got to play for the first time in 2011). All in all, a pretty good year. Let's hope 2012 is just as good.